Maternity clothing is often comfortable and practical. Rarely does it have a sense of humour. Pregnancy is, after all, a serious business. Except, sometimes it is quite funny. You’re flatulent, you waddle, you eat some seriously weird sandwiches and you’re so blissed out on endorphins that you can’t retain basic information. 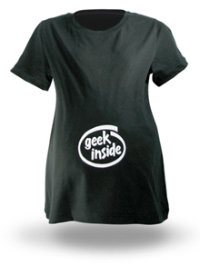 So why not make the most of it and wear some comedy t-shirts designed especially for geek mums-to-be? 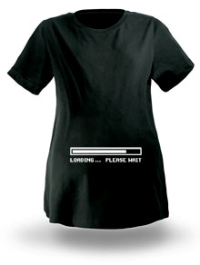 Take this loading….please wait t-shirt (ThinkGeek, $22.99) on the right. Designed for the later months of pregnancy, I’m sure this is how a lot of women feel about their impending arrival. 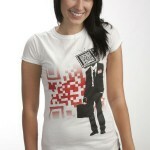 This Geek Inside t-shirt on the left (ThinkGeek, $22.99) is a fun play on the Intel logo. The logo sits right on the bump, leaving others in no doubt of the future of your little one. You could always get them one of these geeky gaming onesie options too. 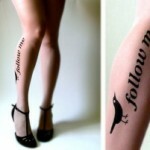 Seen any similar witty maternity clothing options?